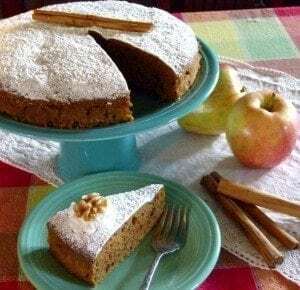 This applesauce cake recipe is a tasty winner without being overly sweet. I remember my grandmother serving applesauce cake when we would visit. Grease the bottom and sides of the roaster with butter. In a medium bowl, mix the dry ingredients. In a small bowl mix wet ingredients. Then combine the wet ingredients with the dry ingredients and mix until fluffy. Stir in the walnuts. Spread the batter evenly in the roaster. Cover and cook for 2 1/2 hours. Remove roster from the Sunflair®. PLace a a rack and remove lid to cool for 30 minutes before removing. Run a knife around the sides and lift out with a spatula. Dust with confectioners' sugar and add a dollop of crème fraîche.